FMIS Equipment Maintenance - 2019 Pricing, Features and Testimonials. Equipment Maintenance Software from FMIS is an on-premise system as well as a web-based system. It is most suited for small and medium businesses with simple equipment management requirements. FMIS has a strong solution for leased equipment management both from a financial (IFRS 16 and ASC 842 compliant) and rental management perspective. Best users of FMIS Maintenance App are from Education, Equipment Leasing, Government, Healthcare, Manufacturing, Oil and Gas as well as Non-Profit Industries. Key capabilities of the product are equipment register, maintenance management, managing equipment lease cycles, evaluating cost of ownership, as well as strong equipment data import and export capabilities. The top feature of the product is equipment tracking and maintenance. The starting price point of this product is £3500. The average implementation period is about 10 days. Eliminate paper-based and spreadsheet-based error-prone maintenance approach. Create a common place for both your office and field-based employees to drive your equipment maintenance program. Increase the lifespan of your equipment by carrying out planned and preventative maintenance. Improve the overall uptime and effectiveness of your equipment by planning and scheduling lifecycle maintenance programs. Import equipment and machinery data by spreadsheet. Set up adhoc import as well as frequent import routines. Create equipment details via barcode audit and as receivables. Create and configure asset details based on equipment type, and also define the amount of data you want to capture for your equipment. Relate images, datasheets, manuals and other important documents to your equipment. Record and audit full details of any equipment, including procurement, warranty, insurance, maintenance and equipment disposal information. Easily arrange equipment based on hierarchy. Define instructions for the end-of-lease and end-of-life stages of your equipment. Create maintenance schedules based on age, dates and equipment meter readings. Plan maintenance activities in details, and these include job sequence, parts and any external involvement. 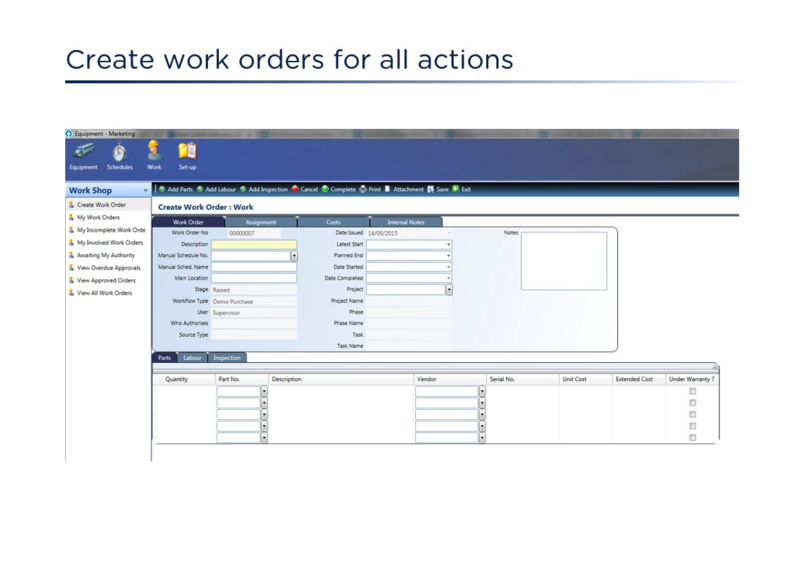 Generate and assign work orders based on threshold limits. Reassign work orders based on availability and competence. Comprehensive flexibility to manage repairable and replaceable parts, their delivery, and invoicing procedures. Undertake an audit-based approach to manage different stages of your enterprise assets. Capture equipment details at procurement stage. Avoid under-maintenance and over-maintenance by taking a data-based decision as regards planned and preventative maintenance tasks. Comprehensive management of leased, transferred or reassigned equipment. Link equipment with users, projects, department or location. Easily know the status of loaned equipment. Easily know rental equipment by location and user within the calendar. Instantly get to know the financial value of any equipment. Supports multiple types of equipment depreciation models. Easily understand the total cost of ownership for any equipment or types of equipment. FMIS’s equipment maintenance management can be integrated with ERP and Accounting Systems such as Sage, Access and Deltek. Asset Tracking, Barcoding, Audits and Fixed Asset Management features can be added to come up with an enterprise asset management solution. The product is most suited for businesses that use leased equipment or lease out equipment themselves. It is used by over 1000 users, indicating that the product is stable and mature. Equipment accounting or fixed asset accounting is a very strong area of the product. Implementation Methodology: The product is implemented by FMIS.